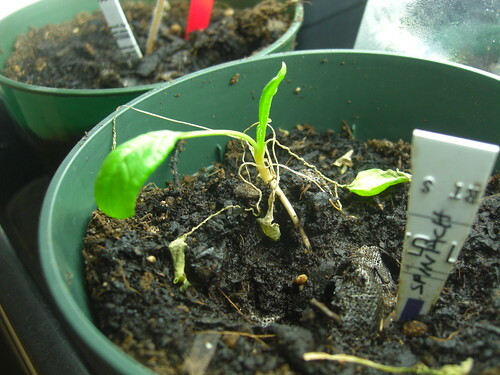 certain seedlings don’t like to be re-potted such as lettuce, spinach, and leeks? I re-potted them using my Mechanic Soil which is peat-less potting soil made with compost and other ingredients. In the past, the seedling loved this potting soil. I briefly sent them to my neighbor for babysitting while I basked in the Caribbean sun for spring break. Subsequently, they got homesick? The blast of cold air from car to door? When I sent them to my neighbor, they didn’t get the same amount of sun like they were use to? I have a three tier lighting system from Gardener Supply. The lights are left on for about 12 hours. One of the plants I lost was a heirloom tomato seedling. This is a first for me in five years of growing seedlings. I never lose a tomato seedling. They are just so darn hardy. You might ask why do I grow spinach or lettuce inside? I just don’t have luck with germinating the seeds in my raised beds. (Quick tutorial on how to make your own raised beds.) I have no idea why. Again, a little help. Every year, I try and grow herbs. One out of four make it. Rosemary. Pathetic. Horsehound. Forget about it. Coriander. Don’t go there. Do I need a heat mat? I am thinking of using my heating pad. Will this work? This year, my hollyhocks aren’t germinating. And for the life of me, how do you get hibiscus to germinate. Even my stevia won’t cooperate! I saved my seeds from my plant last year and nada. Zippo. What’s with the gardening gods this year? Maybe Mother Nature is trying to tell me something? Last year my indoor plants were infested with white flies. It was horrible. Even the ladybugs outside couldn’t keep up. I just prayed for an extremely cold winter (zone 5) to kill those buggers. So, if your winter was bad, blame me. After a fiasco with white flies last year, I am not bringing any new plants into the garden that I haven’t grown. (I think my pineapple or tangerine sage had white flies.) So, I need these herbs to take, readers. Am I the only one struggling with my seedlings? What gardening issues are you having this year? Have many of you have decided to take the gardening year off? Me too! I have 9 apple and 2 peach trees. What do yo have? How do you protect the baby apples from the bugs? Don’t repot your spinach and lettuce, and don’t let them go too long indoors. I think the idea here is just to keep them inside long enough for them to germinate and get a set of true leaves and then move them outside. I started my spinach too early this year (snow melt was too slow) but was aiming for transplanting two weeks after putting seeds into flats. At three weeks they were still ok, but the roots had bottomed out in the flats which I like to try to avoid. On the herbs, I think they generally have a low germination rate. You can make up for this by putting two or three seeds per spot and then thinning as needed.